Sculpin IPA reminds me of some of my fondest days as a craft beer fan. When I was just starting out and Sculpin was somewhat “rare” and definitely one of the hoppiest beers on the market. Now, just like Ballast Point’s clunky, old branding, those days are long gone. Sculpin and its many varieties, like pineapple, habanero, unfiltered and grapefruit, can be found on store shelves across the country. Since it’s summer I decided to leave the familiar classic behind and give one of the newer varieties, Grapefruit Sculpin, a try. Grapefruit is a winter fruit, with Ruby Reds reaching their peak right around the holidays. But this beer is packaged in cans and seems ripe and ready for your next boat or beach trip. A dichotomy Ballast Point addresses right on the can. “Grapefruit’s a winter fruit, but this easy-drinking ale tastes like summer,” says the packaging. Huh, well cheers to that! The first thing I notice about this beer is the noticeably bitter aroma. While there is absolutely grapefruit on the nose, it is more reminiscent of the scent of the pith than the juice. Hiding behind that grapefruit is a nice biscuit-like aroma that I’d expect from a Ballast Point IPA. The beer looks like a classic West Coast IPA stunning clarity, lazy carbonation, and a finger’s width of white head that sticks around – but not for too long. It might be a shade lighter than Sculpin, maybe I’m just imagining it? Just like it looks like a classic West Coast IPA, this beer feels like one, too. Medium body without being chewy. No weight on the tongue from the alcohol and also not too sweet. I’d call it easy to drink, but not easy to chug. Moving on to tasting the beer, you get grapefruit straightaway. Again, more of the pith and the fruit than the juice, which can be sweeter. The grapefruit accentuates the bitterness of Sculpin and multiplies both the fruity flavors and the bitterness. Yet, somehow, this addition of “Natural grapefruit flavor” makes the beer easier to drink. Some of the alcoholic sweetness of this IPA, which weighs in at 7% alcohol by volume, is masked by the addition of grapefruit. The flavor also leaves the palate quickly, even more so as the beer warms up, making you ready for another swig – or another pint. After thoroughly enjoying my first can I had to wonder, how did the brewers get this very specific grapefruit flavor in the beer? It is too pith-y to be juice, but too pure a flavor to be just rind. I contacted Ballast Point to find out. Hillary Cocalis at Ballast Point let me know that the secret ingredient was just that, “Unfortunately, we keep that process a little bit of a secret,” she told me. As for how the brewers identified grapefruit as the perfect compliment to the Sculpin IPA base; she said the pilot batch came out of a tasting room experiment. 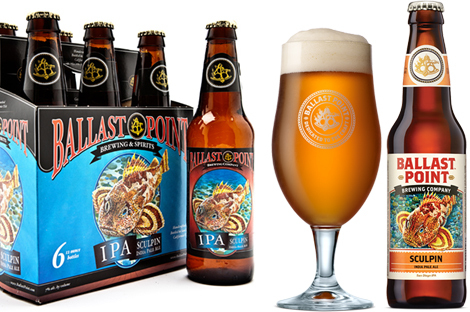 Ballast Point regularly makes small batches that are only served onsite at their California and Virginia tasting rooms. “[Grapefruit Sculpin] was a runaway hit in our tasting room, and so we decided to make more of it,” she said. The citrusy IPA was is such a consistent favorite that it is one of just 23 varieties that Ballast Point offers year round. Do you like your Sculpin with a grapefruit twist, or do you like the classic just the way it is? Let us know on twitter at @ReadOctober. OctFest will bring 90 international breweries to New York City’s Governors Island on September 8 and 9.